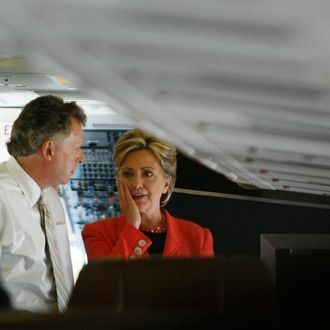 Clinton and McAuliffe on her campaign plane in 2008. In addition to Anthony Weiner’s campaign, those who can’t wait to start speculating about Hillary Clinton’s 2016 presidential run have turned their attention to the Virginia gubernatorial race. Though he doesn’t have a debilitating sexting habit (as far as we know), Terry McAuliffe’s campaign has raised many of the same complications for the Clintons, as they try to help out an old friend without damaging Hillary’s brand. The Washington Post reports that former Clinton staffers are working on both campaigns, and donors are handing over cash in the hopes of currying favor with the first female president. McAuliffe’s role in using the Lincoln Bedroom for fundraising and President Clinton’s questionable pardons has already come up in his campaign, so if you want to rehash some of the Clinton era’s least-entertaining scandals, this is one to watch. Do the Clintons Want Anthony Weiner to Quit the Mayoral Race?